This topic covers the steps required to modify an XA datasource, using either the Management Console or the Management CLI. 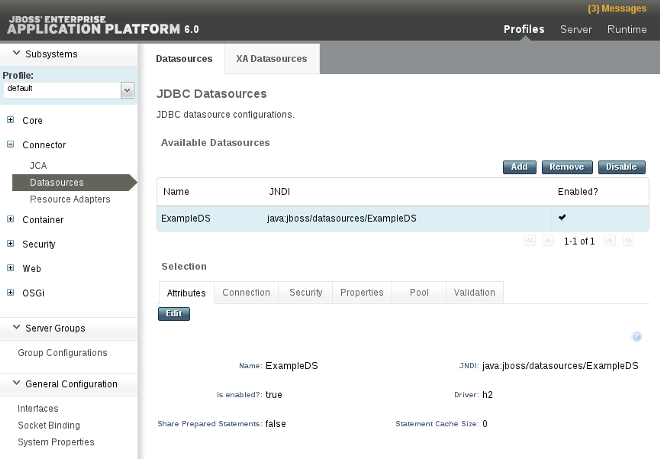 Section 2.6.1, “Start JBoss Enterprise Application Platform 6”. Section 3.3.2, “Launch the Management CLI”. Section 3.2.2, “Log in to the Management Console”. Select the Profile tab from the top-right of the console. Select the Profiles tab from the top-right of the console. Select the appropriate profile from the drop-down box in the top left. Expand the Subsystems menu on the left of the console. Select Connector → Datasources from the menu on the left of the console. Select the XA Datasource panel. Select the relevant XA datasource from the Available XA Datasources list. The XA datasource attributes are displayed in the Attributes panel below it. Select the Edit button to edit the datasource attributes. Edit the XA datasource attributes and select the Save button when done. The XA datasource has been configured. The changes are now visible in either the standalone.xml or domain.xml file, as well as the management interfaces. To create a new datasource, refer here: Section 6.4.1, “Create an XA Datasource with the Management Interfaces”. To remove the datasource, refer here: Section 6.4.3, “Remove an XA Datasource with the Management Interfaces”.